Acrylic, plaster, metal armature, black & green painted wood table. Acrobats on the Pier. (green). 2010. 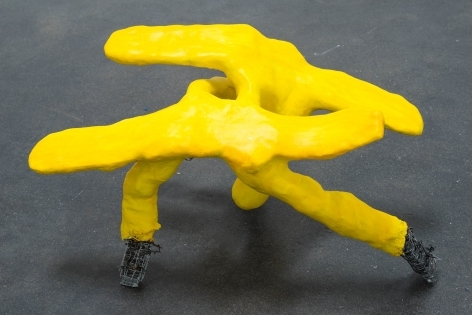 Acrylic, plaster, metal armature, chartreuse painted wood table. Acrylic, plaster, metal armature, light blue painted wood table. Acrylic, plaster, metal armature, unpainted wood table. Circus Clown Fire Brigade. (orange). 2010. Acrylic, plaster, metal armature, light blue painted wood table . Forest Through Trees. ( black + green ). 2010. Patrick Nickell returns to Rosamund Felsen Gallery for an exhibition of new sculptural work, The Lending Library Lends a Hand. In his last exhibition Nickell created large homespun abstract forms that jutted out into space for a rather humorous interaction with shape and line. This new body of work involves a more careful, more intuitive consideration of mass and color, focusing on the gestural and corporeal aspects of form and interactivity. If the previous works conjured historical elements of drawing or even cartooning, this new work concentrates on bodily interfacing and evocative coloring. Nickell has formulated pieces that weave in, on, over and around themselves, and has overlaid them with refined, intensely colored surfaces, often confounding the viewer with a displacement of mass. The viewer is struck by the moments when these initially odd, rangy shapes begin to look like bodies, twisting and dancing before us, and simultaneously appear to be heavily grounded, weighty masses, anchored to their plinths. While maintaining Nickell's customary playfulness, these works, not shying from abstraction, nonetheless point to traditional – often recognizable – forms, and to a practice of sculpture grounded in the idea of both looking back and moving forward. Memory, nostalgia and familiarity are met with the unknown, the unpredictable and the unrecognizable.